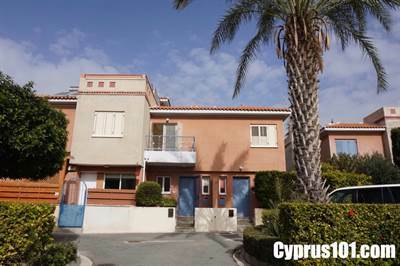 This recently renovated two bedroom Kato Paphos townhouse is situated on a quality development and is conveniently located for both the touristic area of Kato Paphos and the main town of Paphos. The local bus stop is close by and a good variety of amenities including bars, cafes, restaurants and shops are within easy walking distance. The outdoor leisure space is equally as impressive and sliding patio doors from the lounge open on to a private, fully enclosed courtyard garden featuring both a tiled patio and decking area – perfect for outdoor dining and entertaining.